People don’t change much. I’ve met Leon Daniels a few times in his long career, and aside from our shared signs of ageing, he’s much the same positive, ebullient person. 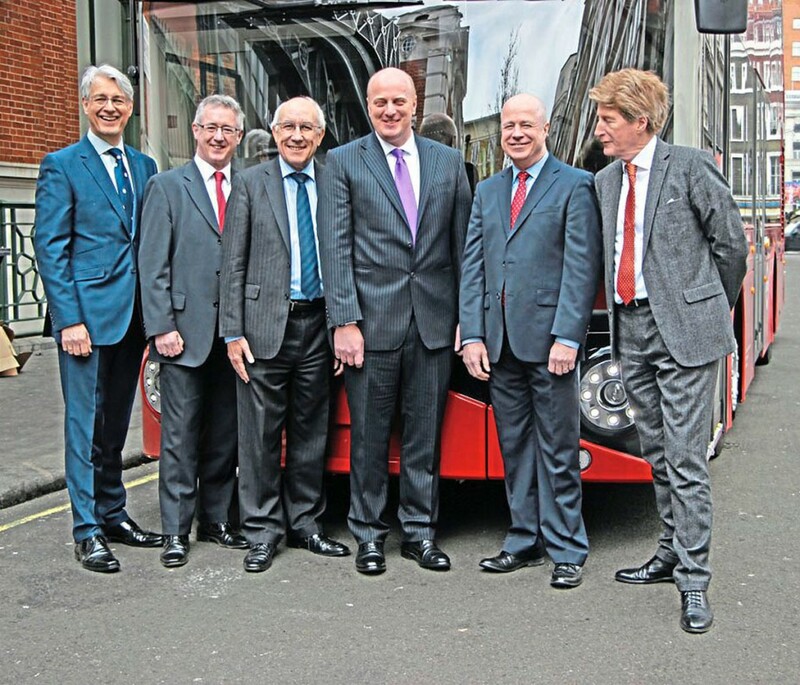 But change is on the horizon for Leon – the Managing Director of Surface Transport for Transport for London. He’s retiring; in the career sense, though not in any other sense. So I ask him when. That’s not even half the story says Leon, telling a tale of virtually heading for the door on a few occasions, only for some event or disaster to occur, and for TfL to grab his arm and haul him back into Palestra, TfL’s smart HQ in Blackfriars Road, where the Surface Transport offices gaze across towards The Shard and the Thames beyond. Leon was precociously interested in this cityscape, and regularly shows off a photo of himself, aged four, wearing a bus conductor’s outfit and shorts: “I remember my dad used to take me on the Red Rover and feeling very excited about London, feeling I wanted to live and work here. By the age of 11 or 12, I was taking those trips alone – in a way that kids don’t do now. He left school with A levels, not long after he lost his father, and plunged straight into work at The Department of the Environment: “It was a small piece of history – I was only there three of four years. I worked for a while with the team which created the Highways Act 1980 – a consolidation of other Acts. We ended up having to re-enact 19th Century legislation enabling the Highways Department to fell trees near trunk roads in the West Country. The Secretary of State didn’t want this right, it just carried through. “I thought this was a worthless thing to do; fighting in Parliament to get laws they do not want. I don’t want to be here.” He went into shipping in 1977. Unexpectedly, he then had a dalliance with publishing, getting through the door at Old Motor Magazine, run by Prince Marshall: “We got into transport by accident,” says Leon. “Prince used to walk his dog in Green Park. The chairman of London Transport had a flat nearby, and walked his dog, when they had conversations. They decided it would be quite a nice idea to run an old vintage bus in service. “So the publishing team were dispatched to get some sponsorship, and got Johnny Walker, the whisky people. They gave enough sponsorship money to restore our wreck, and it ran in service. Progressively, Prince Marshall and Old Motor magazine, and Obsolete Fleet, ran more buses for London Transport. We’re talking late 1970s and early ‘80s, when LT was the owner/operator of the entire network. “We did all the things they couldn’t do, such as sightseeing, filming, TV. We ended up with a sizable bus operation. Prince Marshall died from sickle cell anaemia in his 40s. We tried to keep the buses running but failed because his personal arrangements and business were intertwined. On the face of it a purely commercial investment, CNT was, says Leon, actually a move by the Chinese to restore diplomatic relationships with the West after Tiananmen Square, together with other things the Citybus chairman, T.T. Tsui, did: “We were unwittingly part of a roving charm offensive by the Chinese, like the V&A’s T.T. Tsui Gallery. “In 1995, that diplomatic initiative was over, and my management team bought the company, and expanded it further until 1998, when we exited to First Group, for £23.8 million. And then I did something which is highly unusual; I stayed 13 years with FirstGroup, first of all running my company, then London, then London and the South East, then as Commercial Director for the UK. The timely sale of his shares in FirstGroup – a demand of the new job in public service – was a bonus, says Leon, as they happened to be at their peak at that time. Leon’s day-to-day life has since been varied, to say the very least: “One of the things the bus industry doesn’t grasp is that I spend very little of my time with buses. The whole bus organisation, tendering and service process runs very smoothly. One of the big jobs is managing private hire and Uber, the consequences of roadworks and traffic flow, and cycling. Leon says the breakneck speed of change in technology – particularly with smartphones – has been this decade’s transport revolution: “This has radically changed the way we find private hire vehicles and buses. “Since the dawn of time, bus ridership has tracked population and the rate of change has tracked reliability. The more reliable buses are, the faster the ridership grows. But currently, with bus waiting time at an all-time best, and where bus speeds and customer satisfaction are up, we’d normally see strong ridership increase. But it has not. “One of the reasons demand has levelled off is because smartphones give you the chance to make intelligent choices. In my case, there’s a bus stop outside my house, but I can walk to the station in eight minutes, so I get my smartphone and, if the next bus is in more than eight minutes, I walk. Before my smartphone, I would stand there hoping. Leon is keen to point out that, despite appearances, there is less traffic in London – fewer cars. By removing carriageway for cycling, for example, London is now handling the same cars in less space, though he agrees ‘white vans’ and private hire vehicles have increased in number: “It puts the congestion back to where it was. Cars have been on a constant decline since 2003. Leon shoots a glance to his PR, who Clearly, there’s more to be said, but Leon is saving that for another time. 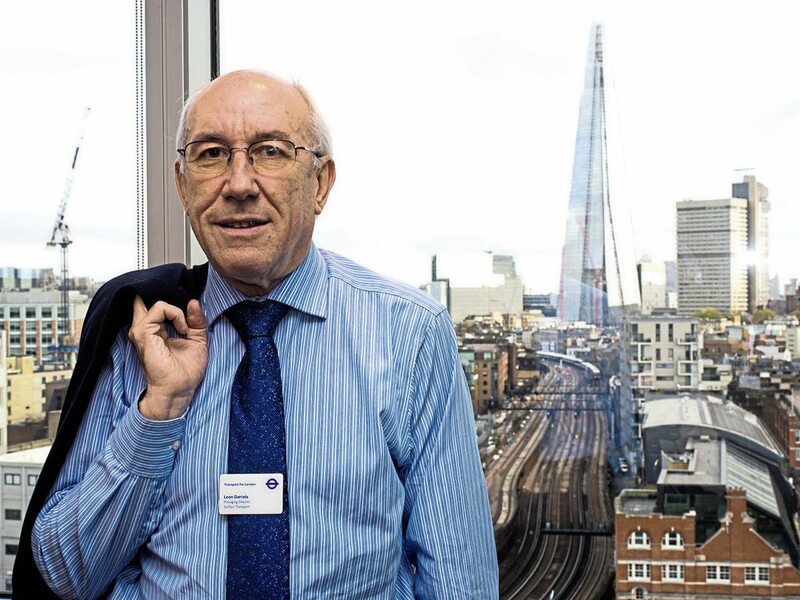 Leon says his time at TfL has ‘book-ended’ his long career, and his exit has been delayed by circumstances, such as Peter Hendy moving to Network Rail, the Mayoral electing in 2016, the new Mayor’s manifesto promises, the Olympics but, shortly before that high point, the low point of the Croydon tram crash. “I stood next to that tram, with bodies strewn around it with a deep sense of loss. That was really difficult. It was exactly a year ago, yesterday morning. We move on to happier experiences, and Leon finds energy in explaining that masterminding London’s transport in 2012 was a real tonic. “Then you’ll remember the first stories in the press, saying the stadiums were deserted. No. 10 rang again, and said ‘You’ve overcooked this; there’s tumbleweed blowing down Oxford Street. The place is deserted. It’s a disaster.’ What we now know is that, in common with other cities who’ve run it, in the early days, there’s a big gap after the opening ceremony for the low-level heats. But, I ask, what were the high points when your company’s name was on the O licence: “Aaaah,” he begins. “That would be when the Conservative Party wanted an open-top battle bus for the campaign in 2004. Conservative central office sent me this young lad, who said the bus we had was just what they needed. ‘How much is that?’ he asked. The allotted hour of my interview is rapidly diminishing, and as we wind down, Leon is glowing with justifiable pride for accomplishing the cycle super highways, Europe’s biggest fleet of electric buses, and building and delivering a cable car. More anecdotes come but as we close, Leon is very keen to add one more thing. “What makes me particularly proud is that I have worked with people to ensure that women and other unrepresented groups get into non-typical areas of business – particularly to get women into highway and civil engineering. There’s a terrible temptation to recruit in your own image.